MUFON have the full report that you can download here on the Stephenville, Texas radar report. This therefore asks some serious questions? the larry King live latest show (aired 11th july, 2008 ) also touches on this, among other things to do with Stephenville, proving this is still not going away…. please see the link https://dandare.wordpress.com/2008/07/12/larry-king-live-stephenville-ufo-aired-july-11th-2008/ which was put on here earlier for the videos from you tube. 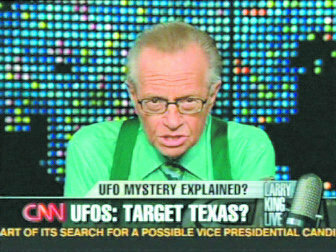 This entry was posted on July 13, 2008 at 12:08 am	and is filed under are we alone?, extraterrestials, Larry King -on stephenville ufo from youtube, larry king show on ufos from youtube, news, newspapers, science, stephenville ufo, stephenville ufo sighting 2008, stephenville ufo sightings, texas ufo 2008, ufo, ufo cover up, UFO Documents/archives, ufo in north america, ufo research, ufo updates, ufo's, ufo's in USA. Tagged: MUFON stephenvillle texas radar report, stephenville, texas radar ufo report. You can follow any responses to this entry through the RSS 2.0 feed. You can leave a response, or trackback from your own site. I have watched several of your shows on UFO’s. I thought this might interest you. I received an email yesterday about a UFO that will make themselves known on October 14th 2008.
please read ….Not sure if it’s on the level…. > Huge UFO to appear on October 14th? > minimum period of three days. > many people as possible. > Federation of Light have said. > TO LEADERS, GOVERNERS, POLITICIANS AND ALL PEOPLE OF EARTH …. > in the south of your hemisphere and it shall scan over many of your states. > We give to you the name of Alabama. > of three of your twenty four hour periods. > WE COME TO ASSIST YOUR WORLD. > WE DO NOT COME TO TAKE OVER. > WE DO NOT COME TO DESTRUCT. > WE COME TO GIVE YOU HOPE. > preparing for these days ahead. > There shall be many who deny. There shall be many who dismiss. > There shall be those who KNOW of this TRUTH. > Which ever you may be … let this be understood. > IT SHALL TAKE PLACE. > initial presentation, we shall simply be presenting our ship to you. > We say to you … That shall certainly be enough to comprehend initially. > our security barrier, but they shall be to no avail.